I am a huge WordPress fan because you can do so much – from just about anywhere. WordPress is the main platform on which a web site is built, and once set up, you add a theme. There are LOTS to choose from! 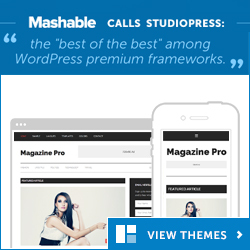 I prefer working with the premium themes created by StudioPress (Mashable calls StudioPress the “best of the best” among WordPress premium frameworks.) These templates, while often can stand alone are modified for clients, and can be used to create beautiful, well-functioning WordPress websites with or without a blog. it is also very easy to change the layout – or “theme” using pre-made templates. If you’re ready for a custom made blog – that’s possible too. It’s a little tricky – but with some custom-made graphics, and changes to the style sheets – it can be personalized to fit your needs. WordPress recently celebrated its 10th anniversary. What started out as a blogging platform is now one of the biggest web development platforms available. WordPress is free – and beautiful – but there is a learning curve. And it’s important that you take precautions against your site being hacked.